When in the supermarket there are about 2 aisles that I gloss over now that I previously wouldn’t have. They contain factory made sauces in jars, preserved food in tins, spice mixes and meal “convenience packs”. I do stock up on some tinned foods like tomatoes and certain beans for salads but mainly I skim over the 2 aisles. I can see why you could be tempted by packets of pre-mixed spices for meat and vegetables and jars of sauces, particularly when you’re in a hurry. There are days when I’m climbing the walls from a teething baby and a cranky toddler that I could be tempted to grab a jar and lash a dinner together and I confess I have done in the past. The problem is that it just doesn’t taste the same, to us, as something that I’ve pulled together myself and there are a large number of preservatives in spice mixes and jars of sauce. Also if I were to use a jar or a packet more than once a week the cost would make a big dent in my shopping budget. The toddler is still quite phobic about his food and this means that food that he can hold in his hand is a hit. So while I may crave a warming chicken stew I might be pushing it a bit to try and get him to eat it despite my best attempts at bribery! Anyway one of the foods that is a hit with young and old alike is chicken drumsticks. There’s no need to hold back for your manners just grab a drumstick in your hand and gnaw on the meat, medieval style. I keep this spice mix in my press. The key is to use equal amounts of each spice and because the jar is designed to hold salt it has a sprinkle lid so I can control the amount of salt and spices I’m adding to each drumstick. You can sprinkle it onto the meat just before popping into the oven/under the grill/on the BBQ or you can sprinkle it on up to 2 hours before cooking to let it permeate into the meat. This mixture is mild but if you prefer more heat on your meat then replace the paprika with cayenne. If you rather herbs then add dried herbs to the mix as well. In order to keep the spice mixture dry I pop 5 grains of rice into the jar and they will soak up any excess moisture and keep it fresh. Last night I sprinkled it lightly on top of some chicken drumsticks on a grill over a tray to catch any fat below, then roasted in the oven for 55 mins at 170 degrees Celcius. 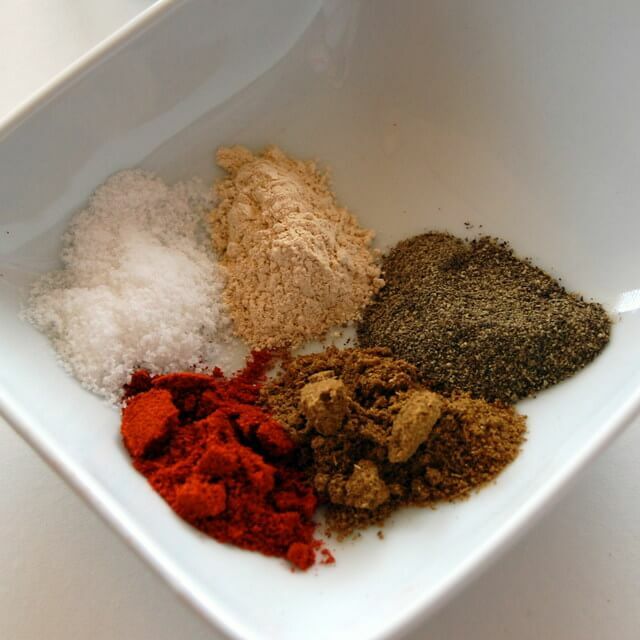 This will save you money on conventional spice mixes. A approximate 30g packet of a shop bought spice mix lasting for 1 meal will set you back in and around €1.50. By making this yourself from scratch you will have enough for 5 meals for in and around €3 (shop bought packets would cost you €7.50). I agree with you totally a few jars of spice in your press to add to your food is far superior to readymade sauce from the supermarket. I love the flavor of cumin in meatloaf etc. I find tinned tomatoes and passata sauce are great store cupboard items. That’s exactly it Doris, there is no need to over complicate things when you’re perfectly able to create spice mixes at home. Thank you! It does, doesn’t it Sandra. It’s brilliant when you can save space, time & money!